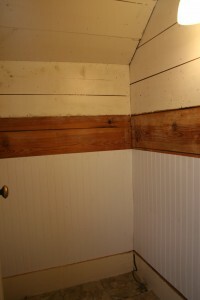 Downstairs Bathroom – the After Pictures! 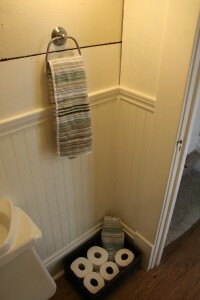 Alright, finally it’s time to show the pictures of our finished downstairs bathroom! I’m really excited to show you these and very pleased that the design I had in my head was realized so well in this renovation. Hooray! The renovation is complete! 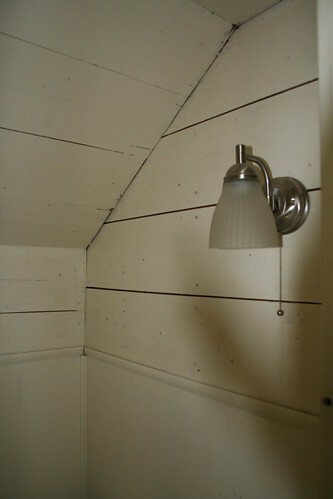 As you can see, we painted the wooden slats that are above the beadboard and trim in alternating white and tan stripes, which run all the way up on the ceiling. 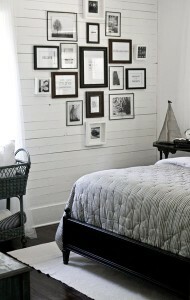 The other elements in the room are dark brown wooden and natural elements. 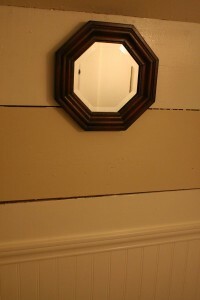 I got this adorable octagonal mirror for a whopping $3.75 on clearance at Hobby Lobby. 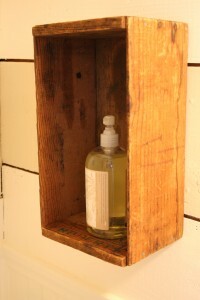 I also got this vintage packing crate on Etsy and hung it on the wall as a shelf for hand soap. 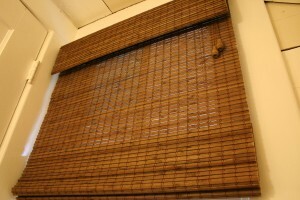 We bought brown bamboo roman shades at Home Depot and cut them down to size to fit the window. I got brown woven basket at Michaels to hold extra toilet paper and towels and you can see the pretty striped blue and tan and white towels that we got for the room. The towel and toilet paper holders we got at IKEA. I think they were something like $8 each, and match the brushed nickel of the existing light fixture pretty well. 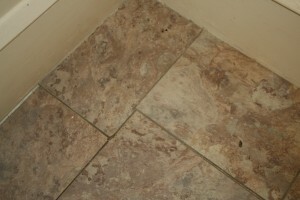 You can also see the new floors Kelly talked me into installing! It’s a really cool vinyl tile that looks like planks of wood. Kelly had to do some creative cutting to get it to install around the trim on the doorframe, but he did, and it looks great! I am so glad we did the floors. The room looks 100 times better with them done. And then of course, there is the crowning jewel of the room – the one item that gives this room so much more function – the toilet lid sink! 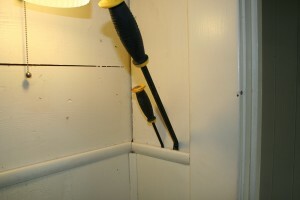 It was (according to Kelly) a snap to install – it just hooks into your existing water line. When you flush, fresh water from the pipe gets routed through the spigot and then after you wash your hands, the gray water fills the tank. Even though the lid expands and contracts to fit multiple sizes of toilets, the one we have in the bathroom is really too small for it. But it still works fine and Kelly sealed it up well with some kind of sticky roofing sealant product that he got for free from a friend. I don’t have a great picture of the hallway, and really, it’s not quite done yet. 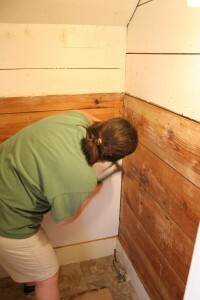 Kelly has to shave a few centimeters off of the bottom of the doorway that leads outside so that it can actually open over the new flooring and also create a new threshhold. 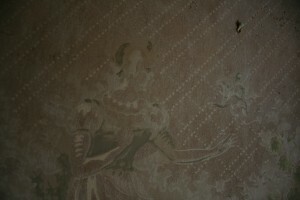 We also need to save up a few pennies to get a few of the remnants of the historical wallpaper we found preserved and framed. We plan to hang them on the wall in the hallway. 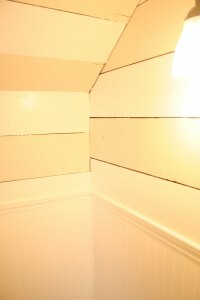 But you can see from this shot that we installed the beadboard and trim here as well, and then, rather than stripes like we did in the bathroom, we painted all of the exposed wood the tan color. Anyway, so there’s our new bathroom – what do you think? Kelly is hard at work finishing up the final final touches on the downstairs bathroom today, while I am at the very quiet reference desk at work. 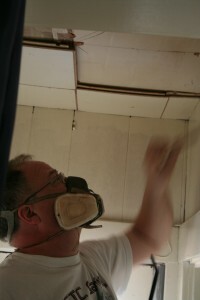 While he finishing things up, I thought I would post the pictures of the bathroom renovation in process and all the things we did to beautify this space. This really wasn’t a pretty space. 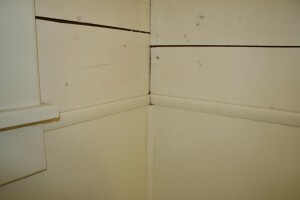 The cream paint just looked dirty, and the 3 foot high paneling was cheap and wasn’t installed well. The floors were a horrid vinyl tile, again shoddily installed (bad installation was a theme all over the house for the previous homeowners…) and they just looked filthy. 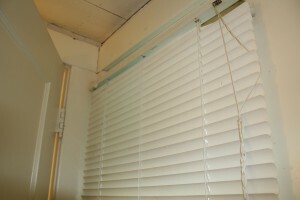 The tiny window was showcased (that’s sarcasm…) by cheapo blinds. 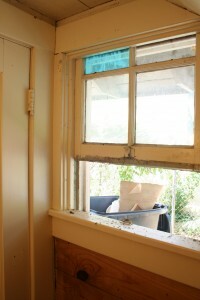 In fact, until we started the renovation, we had no idea that the window had a few hidden treasures of its own! First of all, that there was an original blue stained glass window panel still left in one of the panes! And secondly, that the window actually opened! 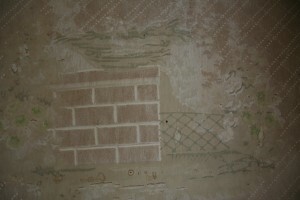 And opened up – into the wall. 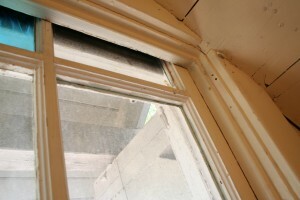 We have a pocket window, y’all! In fact, the only thing this space had going for it was the nice light fixture and the cool looking exposed wood slats, which eventually gave me the idea for the design. 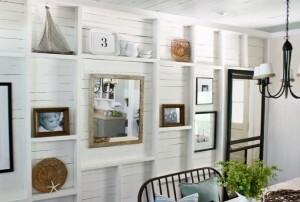 I don’t normally go for “cottage-y, beach-y” design, unless it’s actually in a cottage by the beach. But the exposed wood boards were so cool and are definitely a beach cottage staple. I had been reading a design blog called “The Lettered Cottage” and the designer, Layla, had a few rooms which sparked off the inspiration for our renovation. 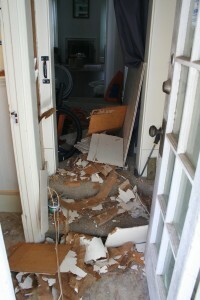 First of all, she has an addiction to tearing down drywall and exposing wood planking! 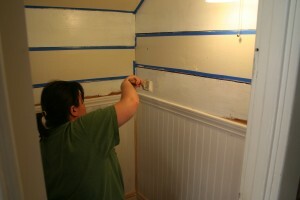 Secondly, she painted these gorgeous horizontal stripes in white and tan. 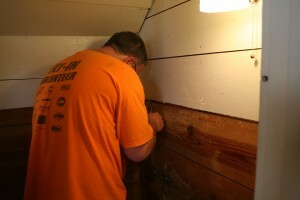 So I thought to myself – we don’t have to expose the wood planking – ours is already there. 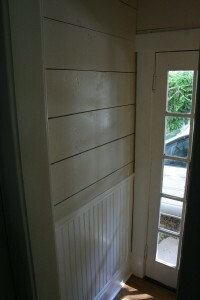 So let’s take advantage of this feature and combined the white and tan stripe idea with the exposed wood! 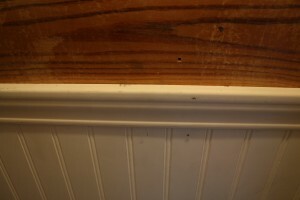 (And add in a little beadboard wainscotting and trim while we’re at it.) 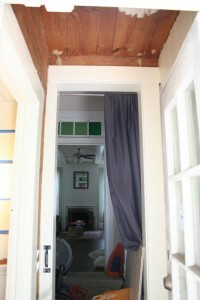 So that, my friends, was the inspiration for the renovation of this tiny, dingy, but full-of-potential space. 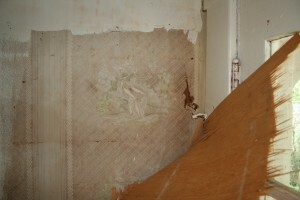 More renovation pictures to follow in the next post! Since it’s not completely ready for the final reveal yet, and since I’ve gotten a few queries from friends about it, I figured I should give you a little sneak peak of what it looks like. Enjoy! So, what do you think of the stripes? I’ve got a ton of pictures to upload from off of my camera, but my home laptop is poorly at the moment, and I don’t want to upload all those pics to my work laptop just to have to transfer them all over to the other one at another time. Anyway. 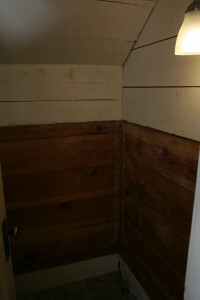 To the subject of today’s post: you may know that we have a downstairs “half” bathroom. 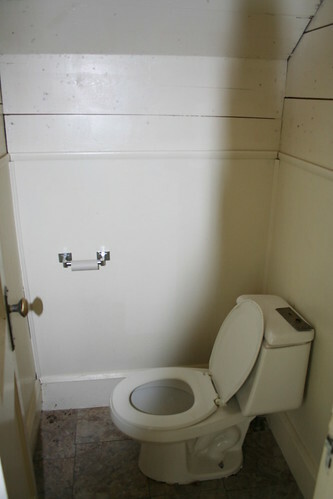 Although, it’s not really a half bathroom, because basically, it’s just a toilet under the stairs. A very cramped little room with barely enough room to turn around in. If someone goes up the stairs when you’re in there, it sounds like a herd of buffalo just went up the stairs. But cramped and noisy space aside, it’s very nice to have a bathroom on the first floor of our house. 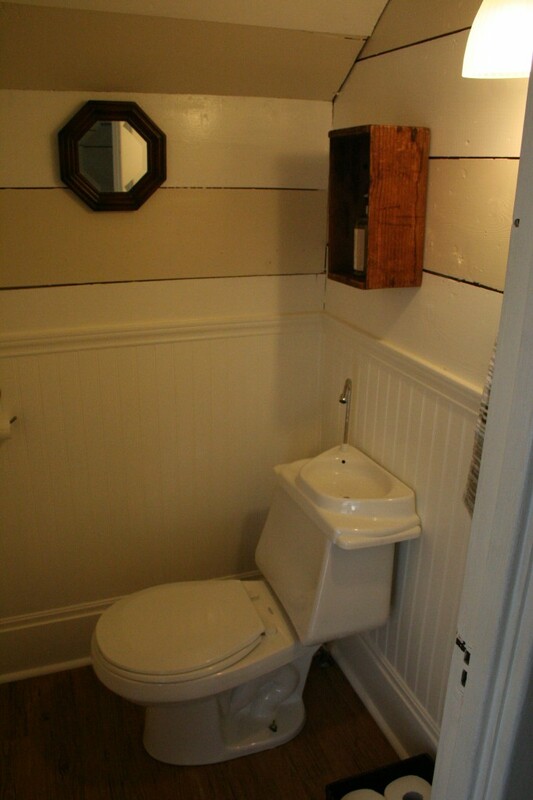 We really would like to put a sink in the bathroom, but it’s a really tiny space! 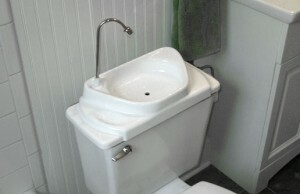 So I started looking around online for some small sink solutions. 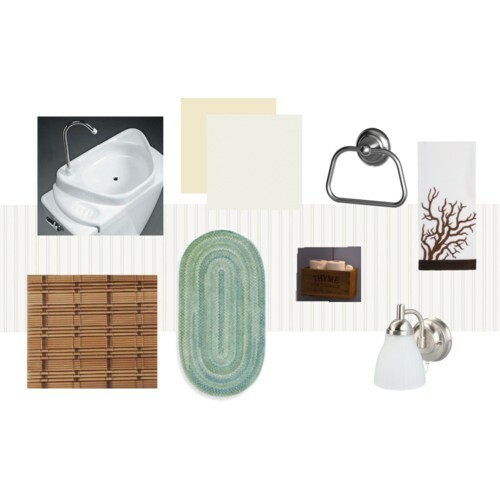 In my hunting, I did find some really cute sinks for small spaces, and some of them were pretty affordable. But since we don’t really have a budget for plumbing and construction at this time, I filed them away until we could afford it. Until I found this beauty: Sink Positive. How cool is this? You replace your tank lid with it and hook it into the existing plumbing line. Then when you flush, the tank refills and sends the water through the tap on top and the gray water from washing your hands fills up the bowl! 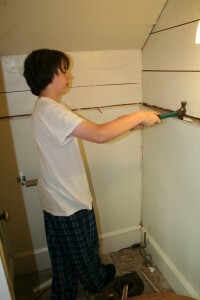 Kelly was very excited to discover a solution to the sink needs in this bathroom that don’t require construction! Now, I’m still not 100% convinced that it will work for us. The contraption is adjustable to fit several sizes of toilets, and I’m a bit afraid to measure ours, thinking it might be too small (it is a very small toilet…) But I hope to do so soon because if we were able to get ourselves a sink in that bathroom, I’m sure it would inspire me to renovate the rest of the space too. 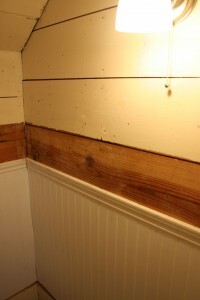 Renovation ideas: pulling off the paneling and replacing it with beadboard, painting the whole space a crisp white – maybe painting a subtle tone-on-tone stripe on every other slat of exposed planking – putting up a shelf for soap, hanging a towel rack, putting up some kind of natural element curtain (bamboo?) 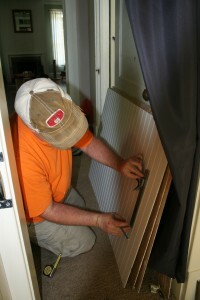 to replace the vinyl shutters and if I can squeeze it in, some kind of a mirror. What do you think?